For the first time, I will get to celebrate Father's Day this year. Not expecting much though, but here I am to share with you one of the many Father's Day contests out there. In conjunction with the upcoming Father’s Day celebration, TNT Express Malaysia has launched its ‘Honouring Fathers’ contest with an aim to connect loved ones. The ‘Honouring Fathers’ contest is open to all Malaysians. 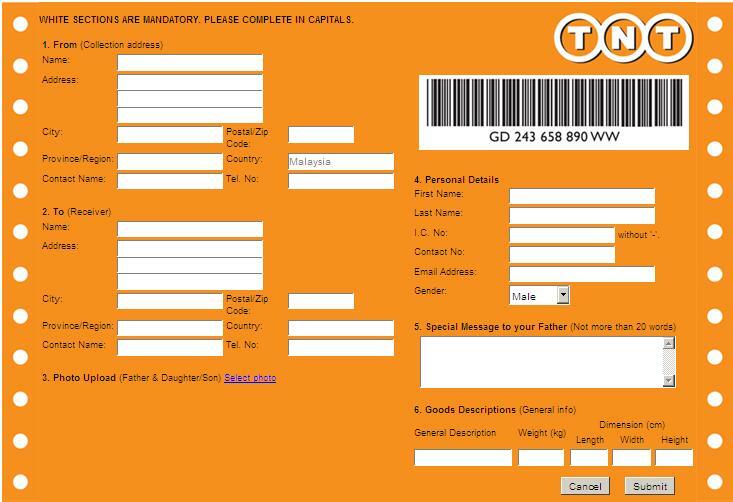 All one has to do is to visit TNT Express Malaysia website at www.tnt.com.my and click the Father’s Day icon. Subsequently just upload a photo of yourself with your father plus share a message in less than 20 words. Submission ends on 3 June 2013. On 5 June 2013, the top 3 winners will be announced. 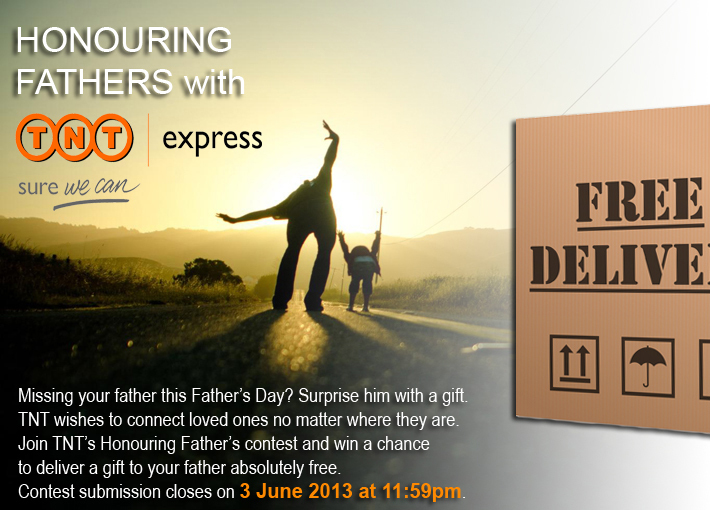 Winners will get a chance to deliver their gift to their fathers anywhere around the world absolutely free. In addition, the grand prize winner’s father will get a flight ticket to return to Malaysia to see the family. “Throughout the years, TNT Express Malaysia has built a reputation on being committed to meeting the needs of our customers, be it for large corporations, small businesses or individuals. Holding the tagline of “Sure We Can”, we have and will continue to be a logistic company that is flexible and offer end-to-end global solutions to service your international shipping needs – even a meaningful and interesting activity such as Honouring Fathers contest is devised to inspire the young generation to appreciate their loved ones,” he added. “With TNT’s efficient and reliable route networks such as the Asia Road Network, European Road Network and air networks, we can definitely deliver the gifts to the winning fathers at the designated time, in any parts of the world – we want to make this Father’s Day a truly memorable one”. For more information about the contest, do visit www.tnt.com.my. Ummmm...TNT, I know, is dynamite, explosive. This one is a courier company, right?